I don't know how the weather sometimes seems to know it's the weekend and after a week of bright sunshine while cooped up inside working, the weekend came and was all gloom, not August feeling at all. But where the sun did not shine through, and though the melanin levels suffered from no beach time, there was still plenty of color. Saturday night we were invited to hear the Blue Oyster Cult play in the Marina from some friends' boats pulled up right next to the stage. They had drinks, a grill with tasty whole fish and hot dogs, and quite possibly the most spectacular sunset of the summer so far. The electric colors competed with the rock for everyone's attention, and the sky won until the sun fully set. It was also a delight to see that there is a gondola available for rides around the Marina, adding to the Venice atmosphere that we appropriated from our sister city in Italy. It was utterly charming, and the passengers were treated to an gorgeous evening of epic proportions. Soon after the sun set, the (badly, badly needed) rain began to fall, and we enjoyed the rest of the night below deck, listening to the rain beat on the rood as we gently rocked and loved every minute of it. Thanks, Commodore Farrell! Though Sunday rose as another gloomy day (August Foggest), Venice doesn't let that dampen the spirits at all. 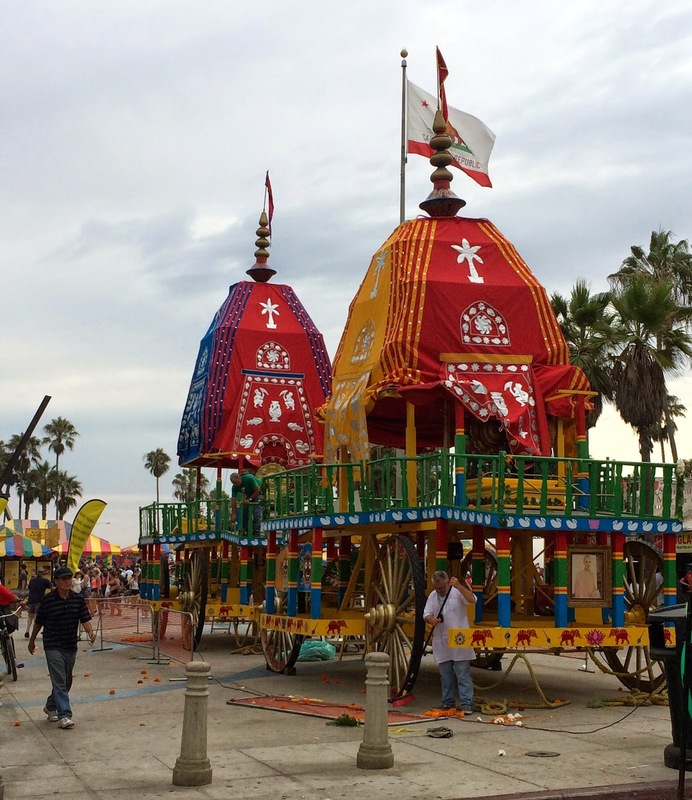 It was the annual Festival Of The Chariots and the Hare Krishna colors were flying high. Everyone looks forward to this day each year as the parade comes down the Boardwalk and invites all it passes by to join in the dancing, sharing and fun, regardless of religious affiliation. Like it should be. Stephanie captured a little of the action, so you can kind of feel what it's like as the saffron colored flowers are tossed out to the crowd by the people in saffron colored robes aboard the chariots. In spite of the grey skies, the weekend was FULL of color, and the kind of days that carry on with the fun, no matter what the weather does. Yeah, we weren't able to do the usual weekend solid beach days, but were instead rewarded with perfect afternoon Bloody Marys by George at The Townhouse, occasional glimpses of blue sky, rain drops on our upturned and grateful faces, and a finale of a delicious meal at the good old Galley. Weekends are just great in Venice ... no matter what. Hope yours was exceptional too. And extra colorful!